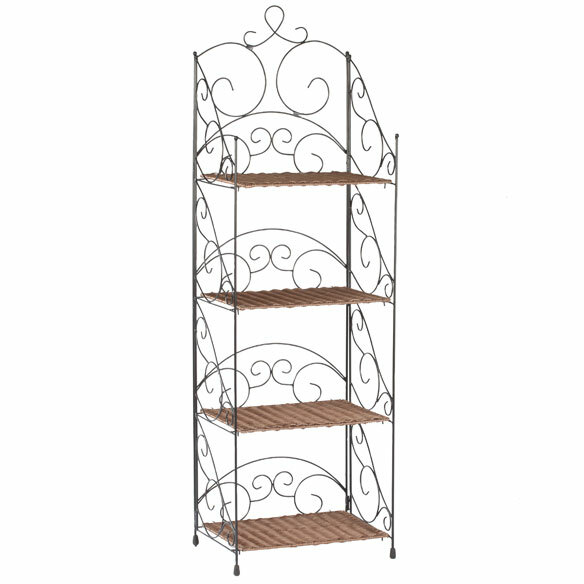 Versatile four tier wicker & metal shelves by OakRidge™ shelves are perfect for organizing any room in your home. Ideal for storing media in the living room, books in the bedroom, towels in the bathroom or snacks in the kitchen. 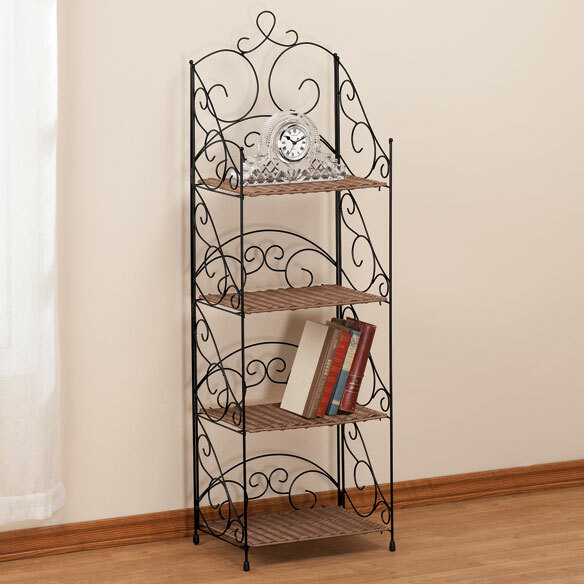 An OakRidge™ exclusive, the black metal and dark brown wicker shelves complements any furniture and home décor. Easy setup — open and insert shelves. Metal shelving wipes clean and folds flat for storage. 15 3/4”L x 10 1/2”W x 50”H overall. 14 3/4”L x 10 1/2”W shelves are 10 3/4” apart. Bottom shelf is 2 1/2” off floor. I wish I had found this sooner to reduce clutter. It is very pretty. Holds a lot without taking up much space at all. Just the right size for the space. Easy to set up and use. From box to kitchen in less than five minutes. I am using the shelf in my kitchen and it fits right in. Very easy to set up and move around yet very strong and well made. Exactly what I was looking for. Not real big but just right for the spot I wanted filled. Could probably not put real heavy thing on the top two shelves but good for knick knacks. A PERFECT SOLUTION FOR EXTRA SPACE TO ORGANIZE MY TOWELS, WASH CLOTHS, ETC. 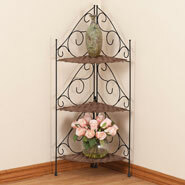 Like this one as much as the corner shelf. It has a good bit of room on the shelves. So simple to put together. Relly cute. Open grill w/shelving that matches other shelving in my apt. The right size for where I need it.